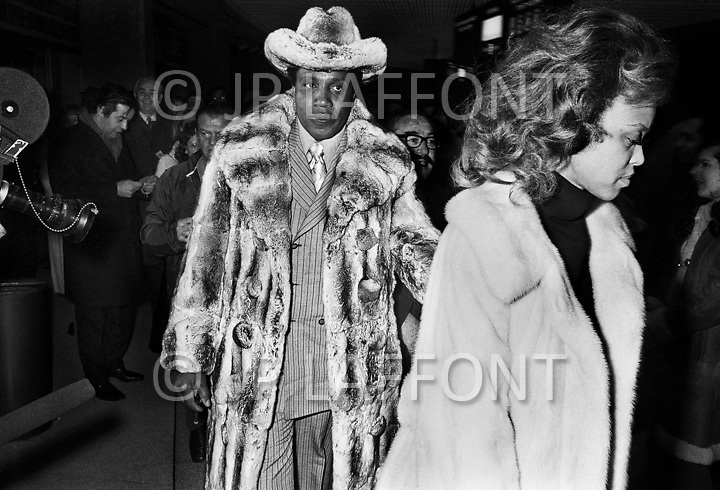 Frank Lucas attends Ali vs. Frazier boxing match with his wife, wearing the famous expensive chinchilla fur coat. It was during this match that he caught the attention of the police due to his extravagant outfit and better seats than many famous people present there. Frank Lucas (born September 9, 1930) is an American organized crime boss, and former heroin dealer, who operated in Harlem during the late 1960s and early 1970s. He was particularly known for cutting out middlemen in the drug trade and buying heroin directly from his source in the Golden Triangle. Lucas boasted that he smuggled heroin using the coffins of dead American servicemen from Vietnam war.